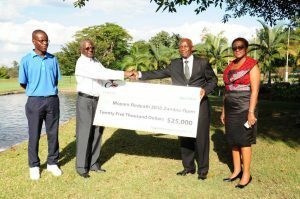 The Mopani Redpath CEC Powers Mopani Zambia Open teed off on 23rd April 2018 at Kitwe’s Nkana Golf Club. 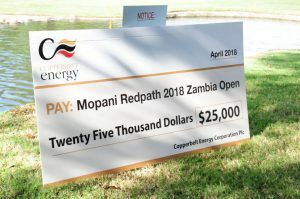 This is the third time that CEC’s customer, Mopani Copper Mines Plc (“MCM” or “Mopani”) has hosted the tournament and equally the third that CEC has partnered in joint sponsorship. Board Chairman, Hanson Sindowe, handed over the sponsorship cheque of USD25,000 to the tournament organizer on Friday, 20 April 2018. 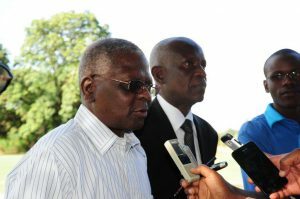 “We have been supporting this tournament for some time now because we decided that our support to sport should not only be to football”, Sindowe said. 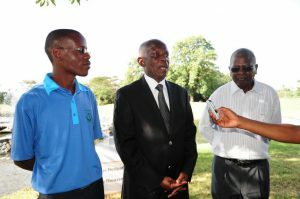 A CEC golf team will participate in the Pro-Am competitions slated for Tuesday 24th and Wednesday 25th respectively.